Last week we introduced our discussion on the rise of conscious consumerism, in which we’ll be spotlighting a number of Feedr vendors over the next few weeks. This week is the turn of Farmstand. Delicious food. Sustainably sourced. This is the resounding philosophy of Feedr vendor, Farmstand. From farm to plate, the company ensure that their ingredients are environmentally sound, fulfilling not only consumer demand, but also adhering to the Farmstand philosophy. Building strong relationships with suppliers is of upmost importance to the company. They know each supplier inside out and work closely with them to ensure that everyone involved feels happy and appreciated. Healthy lunch pots from Farmstand. Farmstand’s ethos extends to the ingredients used in each and every dish, prepared and cooked on site. Fruit, vegetables and grains are sustainably grown and free from antibiotics, hormones and GM. A focus on using fresh, seasonal produce allows them to cut their carbon footprint to the absolute minimum. Animal welfare is a growing concern in the UK, and many are joining the widely reported vegan revolution. But it’s understandable that while we may support the humane treatment of animals, not all of us want to give up meat altogether. Farmstand echo this notion and ensure that their beef, chicken and lamb dishes contain meat from only naturally fed, humanely treated livestock, sourced from local family farms and butchers. 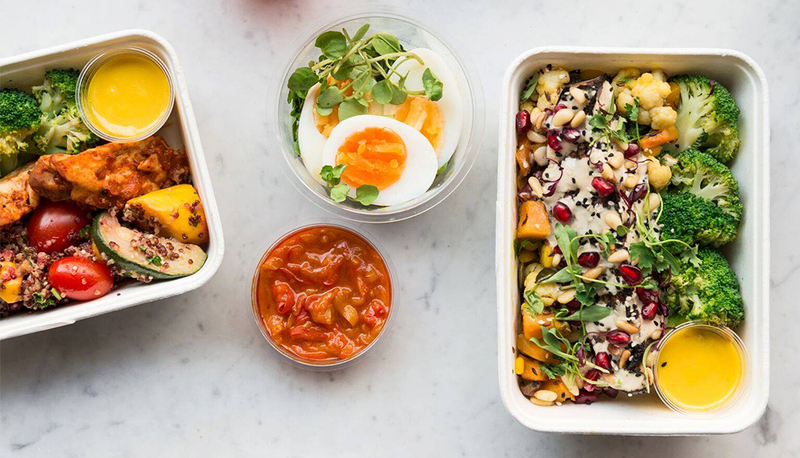 The Feedr vendor offer an exclusively dairy and gluten free menu, using exciting alternatives like COYO coconut yogurt to satisfy both your taste buds and your hunger, so you never feel like you’re missing out. With increasingly busy lifestyles, many of us are turning to convenience food to cut down on time. Unfortunately, these changes in consumer habits can have a detrimental impact upon the environment, with a phenomenal amount of waste produced by take-away packaging on a daily basis. Farmstand refuse to contribute to this issue and work with London Bio Packaging to source 100% compostable packaging, including napkins and utensils. We admire Farmstand’s commitment to sustainable and ethical standards within the industry and are proud to support them as one of our trusted vendors. Keep your eyes peeled for next week’s spotlighted vendor, Karma Cans.